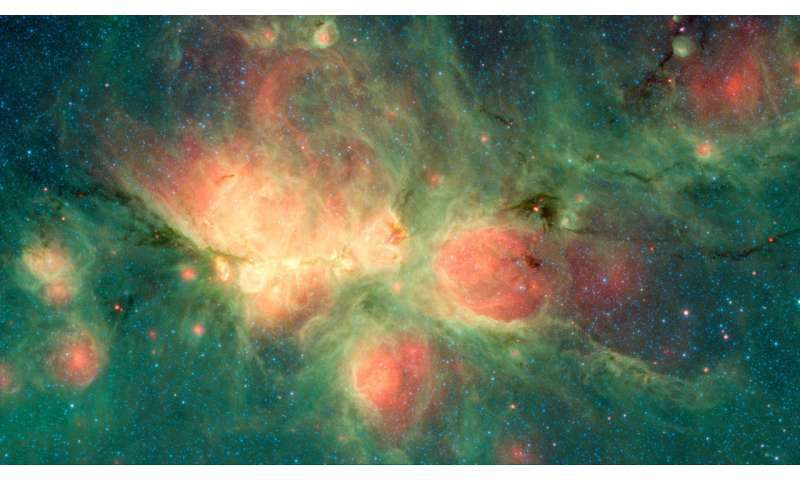 The green areas show places where radiation from hot stars collided with large molecules called "polycyclic aromatic hydrocarbons," causing them to fluoresce. In some cases, the bubbles may eventually "burst," creating the U-shaped features that are particularly visible in the image below, which was created using data from just one of Spitzer's instruments. The Cat's Paw star-forming region is estimated to be between 24 and 27 parsecs (80 and 90 light years) across. It extends beyond the left side of these images and intersects with a similar-sized star-forming region, NGC 6357. That region is also known as the Lobster Nebula – an unlikely companion for a cat. 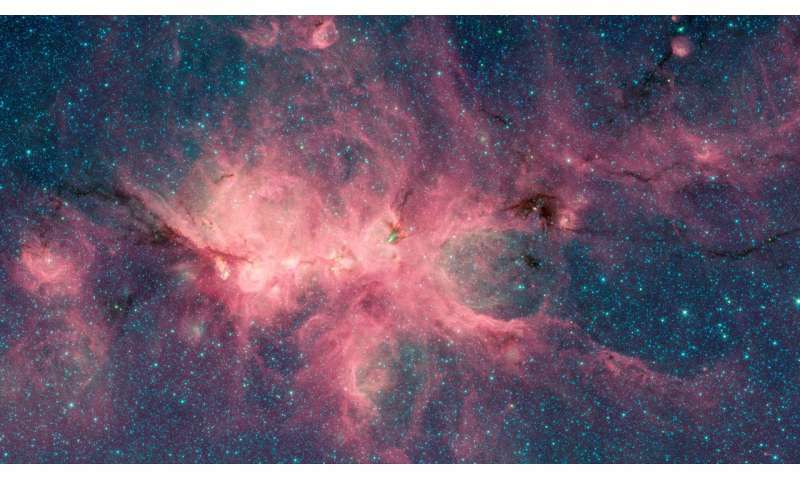 The top image was compiled using data from the Infrared Array Camera (IRAC) and the Multiband Imaging Photometer (MIPS) aboard Spitzer. MIPS collects an additional "color" of light in the infrared range, which reveals the red-colored features, created by dust that has been warmed by the hot gas and the light from nearby stars. The second image is based on data from IRAC alone, so this dust is not visible. The images were pulled from data collected for the Galactic Legacy Mid-Plane Survey Extraordinaire project (GLIMPSE). Using data from Spitzer, GLIMPSE created the most accurate map ever of the large central bar of the galaxy and showed that the galaxy is riddled with gas bubbles like those seen here. Otherwise known as glow mode plasma. Whatever it is called, it shows the majestic forms that gasses and dust take on in the Cosmos. is sheer speculation totally devoid of facts. It's non-science! Why would the gas collapse to form a star if any heat from internal pressure would cause it to expand? The researchers do not show how the equilibrium condition of self-gravity versus heat pressure (The Jeans Mass limit) would be overcome. Right now there just isn't any confirmed, real, scientific solution to that problem - notwithstanding all the posturing via dark matter. What would you know about science, god-boy? Stick to myth and superstition, yes? Don't need much of an IQ for that, so you should be right at home. You must mean the ghostly Myth of Dark Matter/Dark Energy - which are STILL unproven, try as they might, and even LIE as they might - and it will soon be relegated to the junkyard of superstitions by scientists using reason and common sense - which you are seriously lacking. The Truth will set you free, jonesybonesy, and maybe some day you will see the Light.